V2553. 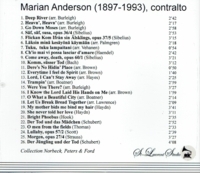 MARIAN ANDERSON, w. Lawrence Brown, Kosti Vehanen & Franz Rupp (Pfs. ): Songs by Bach, Haydn, Handel, Schubert, Strauss, Sibelius, James Hook, Christopher Thomas & Cyrill Scott; Spirituals. (Canada) St Laurent Studio YSL 78-629, recorded 1928-47. 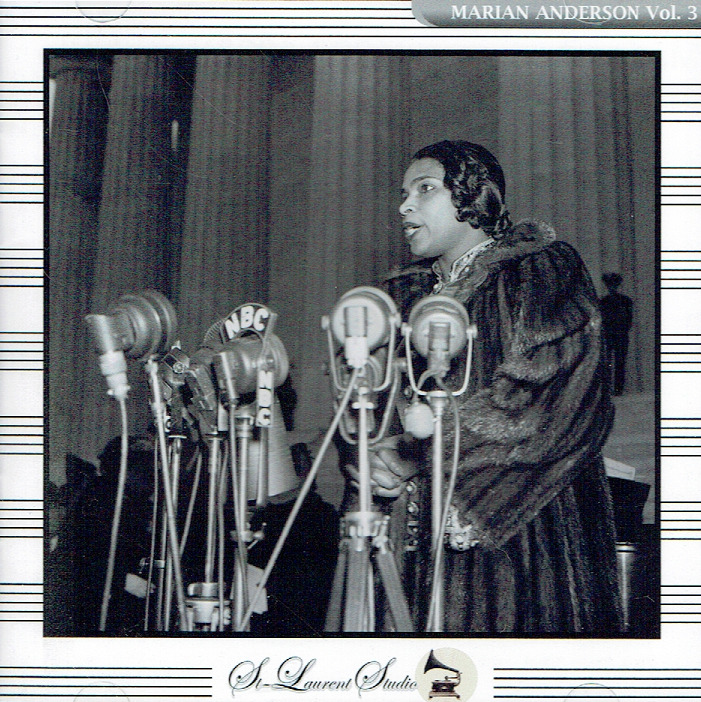 "Arturo Toscanini legendarily once told Marian Anderson that she had a voice 'heard once in a hundred years'. Up that ante to 200, 300, even 500 years, and it still holds true. Anderson was an artist of such immense nobility, dignity, and integrity, gifted by God with a voice of such deeply poignant, ravishing beauty and faultless technique, that it is difficult for me not to break out in tears upon hearing anything she recorded, both in thankfulness that mortal ears are allowed to hear sounds of such transcendental beauty and in deep moral outrage at the blind insanity of racist bigotry that denied her the even more stellar career than the resplendent one she achieved in spite of all such obstacles. 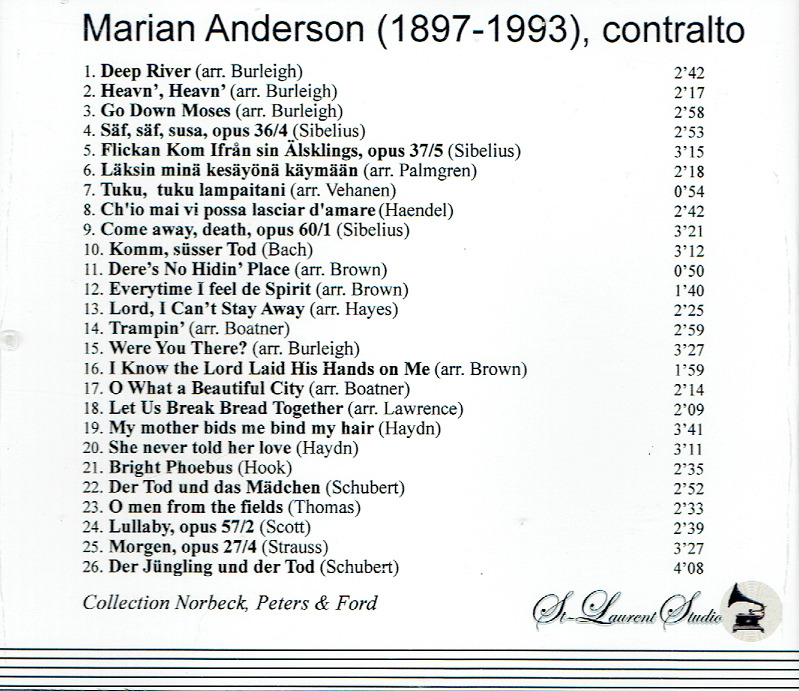 Anderson's 78rpm recordings have been issued many times over on many different labels. Do you need to consider buying this one? Absolutely. St. Laurent Studio (YSL) follows here [the] remastering philosophy of little or no application of noise reduction technology, in order not to interfere with the timbre of the voice. Different folks have different reactions to that philosophy; some embrace it passionately, while others find the level of background noise too disconcerting and prefer judicious filtering instead. While I tend to be in the latter camp, in this instance I am in the former one instead. In exchange for tolerating an extra degree of aural grit, we are rewarded with an unusually rich reproduction of Anderson's glorious voice, with a degree of vibrancy and color I have not heard in other releases. I am positively floored by her wide range of tonal timbres, from the deep melancholic contralto of 'Trampin' to the artless lyric charm of 'Die Forelle' to the clarion dramatic soprano of 'Oh, Wasn't dat a Wide Ribber'. If you are already a fellow Anderson devotee, you owe it to yourself to hear and acquire this new remastering. If, by some unfathomable stretch of the imagination, you are not yet familiar with Anderson's art, you owe it to yourself to hear and acquire this new remastering to bring this majestic presence into your home and heart. YSL is to be commended for a little booklet prepared with care; while as usual it provides no program notes or texts, every selection is unusually and artfully well documented with four different shades of ink (black, dark gray, light gray, and wine red) for different types of information. There are also two photos of Anderson, with Harry Truman and John F. Kennedy respectively. This treasure may be purchased from Norbeck, Peters and Ford (norpete.com)." "The great American contralto scarcely needs an introduction. Her rich, vibrant voice, unique in its colors and timbre, was coupled with excellent musicianship, a seriousness of purpose, and depths of emotional involvement." "It is difficult now to separate the voice and the woman from the almost marbleized monument that Anderson became long before she died in 1993. America's traveling good will ambassador, a special United Nations delegate, the subject of numerous television documentaries, and a beloved icon."